Porsche has officially launched the second generation 991 Carrera 4 range, including the 2016 model year Targa 4 and Targa 4S variants ahead of the cars’ in-the-metal debut next month at the Los Angeles Auto Show. Like the new Carrera 2/2S platform (which you can read more about in the latest issue of Total 911, launched today), the 991.2 Carrera 4 and 4S sees the flat six under the revised decklid switch to a 3.0-litre twin turbocharged version, producing 370hp in Carrera trim and 420hp in the ‘S’. Porsche Active Suspension Management (PASM) comes as standard on all Carrera 4s and 991.2 Targa 4s, while rear-wheel steering is an option on the 4S variants of both body styles. Like previous generations of four-wheel drive Porsche 911 Carrera, the 991.2 C4 is visually distinguishable from the C2 version thanks to the wider rear arches, flared by 44mm. The iconic full-width light bar also returns, melding seamlessly with the 991.2’s Macan-style 3D effect brake lights. The four-wheel drive system in the quartet of new Porsche 911 C4s is now electro-hydraulically controlled, utilising technology from the current 991 Turbo. This switch provides even greater sensitivity for the Porsche’s Torque Vectoring, “enhancing stability without sacrificing agility”. This allows a PDK-equipped 991.2 Carrera 4S with the optional Sport Chrono package to sprint from 0-62mph in 3.8s, a tenth of a second faster than the new Porsche 991.2 Carrera 2S and 0.3s faster than the equivalent first generation 991. 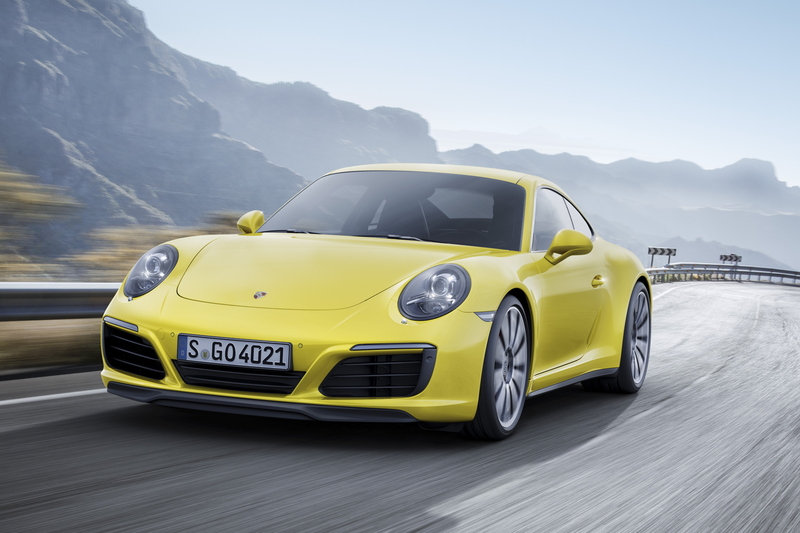 Performance gains across the board are countered by an improvement in fuel efficiency for all four models, with economy boosted by up to 12 per cent, with the 991.2 Targa 4S (with PDK) seeing the greatest improvement. Inside, the changes are as per the 2016 Porsche 911 Carrera, with a new steering wheel that features a mode switch when combined with the Sport Chrono package. There is also the option of a smaller, 360mm ‘GT Sports’ wheel while a larger, revised PCM screen and interface has been introduced. UK pricing has yet to be announced however, in Germany, the new Porsche 911 Carrera 4 will start at €103,983, a €7,378 increase over the list price of the Carrera 2 model. To read all about the new 2016 Porsche 911 Carrera platform, pick up the latest issue of Total 911 in store today. Alternatively, you can order issue 132 online for home delivery, or download it straight to your digital device now.